The Careening Dirigibug (サクレウラメ?, lit. : "Backfiring Explosion") is an unusual insectoid enemy in Pikmin 2. It's a legless creature that slowly drifts through the air by utilizing colorful, balloon-like air sacs attached to what can be considered its head. When leaders or Pikmin approach, it will produce a bomb rock from its mouth and attempt to throw it down near them. The bomb rocks thrown by the Careening Dirigibug are not player-exclusive and can damage nearby enemies and hazards. It is found solely underground, in caves, Challenge Mode areas, and the Hostile Territory in 2-Player Battle. Careening Dirigibugs are always found in caves. They start off slowly drifting around in wide arcs at a similar height to Swooping Snitchbugs. 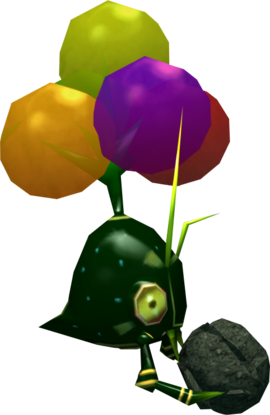 However, when approached by a Pikmin or leader, a Dirigibug will produce a bomb rock from its mouth in about two seconds. It will then try to approach the Pikmin or leader, and once close enough it will stop to throw the bomb rock on the ground, activating the bomb rock's timer. The bomb can kill Pikmin, damage leaders and enemies, and defeat hazards, but it does not seem to hurt the Dirigibug if it is in the air. However, the bomb rock can still damage the creature if the latter is grounded. If the Pikmin or leader exits the Dirigibug's territory while it has a bomb, it will continue to hold it for roughly twenty five seconds, until just dropping it anywhere. Careening Dirigibugs can be defeated in the same manner as Scarpanids and other flying enemies: rapidly throw Pikmin onto it while in the air, then swarm it when it falls. Like members of the Scarpanid family, the Careening Dirigibug can shake off Pikmin up to four times before dropping, but a Purple Pikmin will ground them immediately. Approach the creature from behind if possible, and use ultra-bitter spray if it is carrying a bomb-rock. Unless it's petrified, the creature will throw its bomb a random distance in front of it when attacked. Should the bomb land too close to the Dirigibug, it is safest to back off and attack after the bomb has exploded. With speed you can accomplish this before the Dirigibug can produce a new bomb. Careening Dirigibugs are useful in that they can take out other enemies. You can lure it into throwing a bomb-rock in front of you and the enemies, and then run off. 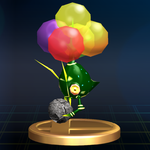 The Careening Dirigibug appears as a trophy in Super Smash Bros. Brawl. “A dangerous, offensive-minded creature. It uses balloons to keep it afloat as it flies through the air and drops bomb-rocks on ground-bound prey. These bomb-rocks sometimes turn out to be duds, but since the slightest stimulus can set these things off, the ultimate care should be taken with them. Notes: Move to the glitches article when they're good, but first, confirm them. There is a rare glitch where one can be seen floating without balloons. In some dungeons like the Hole of Heroes, a Careening Dirigibug can throw a bomb rock over a barrier when trying to kill Pikmin on the other side. On the first floor of the Cavern of Chaos, some can get caught in the pipes. One glitch that can occur with the Careening Dirigibug involves invisible bombs. A leader may activate a bomb while the Dirigibug is still holding it, which will cause it to explode while the creature is still holding the bomb. The Careening Dirigibug continues the "holding" animation, even when there is no bomb there. It will eventually perform the throwing animation without the bomb. In this creature's Piklopedia entry, petrifying it just as it breaks free from another spray makes it possible to freeze it and its bomb-rock separately. Careening in a chiefly North American sense means moving "in an uncontrolled way in a specified direction", which the Dirigibug performs to some degree. "Dirigibug" is a combination of "dirigible", referring to how the creature stays afloat using large balloon-like sacs, and the word "bug". In Japan, it is known as サクレウラメ?, which could be translated as "Backfiring Explosion": さくれ? means "explosion" and うらめ? means "backfire". The reason for this name is unknown, since the explosions never backfire on the enemy. Its scientific name is Flotillium circusmaximus. Flotillium is similar to the English word "float" and circusmaximus is a combination of "circus" and "maximus". This might be referring to how the creature's colorful balloons make it look like something out of a circus, but it could also be a possible reference to the ancient Circus Maximus in Rome. Its internal name is bombsarai, which is a combination of "bomb" and "sarai", with the latter being the internal name for the Swooping Snitchbug. A Careening Dirigibug in the Piklopedia. Another screenshot of the creature in the Piklopedia. A Careening Dirigibug carrying a bomb rock. A Careening Dirigibug without a bomb rock. The Brazilian Treehopper, a real world insect that bears a striking resemblance to the Dirigibug. The creature's e-card, #37 (14th yellow card). The trophy description details that Careening Dirigibugs occasionally throw dud bomb-rocks, which is not true in Pikmin 2. This is likely the result of a mistake. A glitch does exist where bomb-rocks stay stuck and never explode, but it is unlikely that this is what the trophy was referring to. The Careening Dirigibugs bear a strange resemblance to the Eosapiens from the documentary "Alien Planet", and also from Wayne Barlowe's book, Expedition. Both these creatures float using gas-filled sacks on their heads, effectively hunt down their targets, and also have generally similar body shapes. It is odd that Louie details the balloon-like air sacks in his notes, because the air sacks all burst upon defeat.